What’s good, everyone? After much encouragement in my comments (thanks! ), I’m back to writing regular wash day posts. Right now, I’m a bit over 9 weeks post and I have plenty of new growth. I think it’s due to my vitamin intake and my regular workouts. For this wash day, I knew I wanted to stretch my new growth. Normally, I use roller sets to do this but this week I started my wash day really late. I thought it would be easier to blow dry the roots. Here’s how it went . . .
(1) Sectioned into 4 and finger detangled. pre-poo with coconut oil and Shea Moisture Raw Shea Butter Reconstructive Finishing Elixir. Covered with a plastic cap and kept under my heating cap for 15 minutes. (3) Tea rinse with green and black tea. Left on for about 5 minutes while it stopped dripping. Then, I applied Aussie Moist over it. I saw that Jeni at Just Grow Already uses an instant conditioner after tea rinsing so I wanted to try it to help use up the instant conditioners that I have. (4) Rinsed and towel dried for 10 minutes. Protein layered my ends, edges and nape with Aphogee Keratin 2 Minute Reconstructor. Deep conditioned with ORS Replenishing Conditioner mixed with olive oil and castor oil. Covered with plastic cap and kept under heat for 30 minutes. (5) Rinsed and detangled with warm water and used cool water for the last rinse. I also did an ACV rinse. Then, t-shirt dried for 20 minutes. (6) Sectioned into 4 and applied leave-ins (Giovanni Direct Leave-in + Aphogee Keratin and Green Tea Restructurizer). Then, I tension blow dried the roots with warm/cool air. After I dried each section, I detangled again with my denman brush. Lately, I notice that I don’t get all the shed hair out and it causes tangles. 🙁 Then, I sealed with my hemp seed and coconut oil mix. (7) By that time, it was really late (~1 a.m.) so I put my hair in 4 braids and went to sleep. The next morning, I put it in a tuck and roll style which has been my go-to style these days. I started this wash day SUPER late because I got home late that day. I probably should have waited until I had more time but my hair had some build-up and felt strange and greasy. I thought that blow drying would be an easier option but I was just sleepy the whole time. I will probably roller set next time. 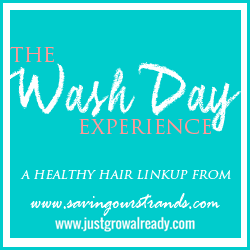 Wash Day: Protein to the Rescue??? I did my instant conditioning before the tea rinse, but I guess it makes better sense to do it after, will definitely try that next time. Thanks! I just tried it for the first time and it seems like a keeper. Thanks, Becca. I’m taking a hair, skin, and nails vitamin and I noticed that I have much more new growth now. I love your hair color and your style is uber cute! Is this the first time that you’ve taken a skin, hair, and nail vitamin? Do you like it? Thanks, KLP. I’ve taken biotin and Bio-sil before. Bio-sil gave me a terrible reaction within a few days so I had to stop it. Perfectil is okay so far.